I don't typically allow the kids to drink much soda unless we're out to dinner somewhere or it's a special occasion. And, I'm pretty much a strict water and iced tea drinker. I do buy pop, however, off and on for the hubby to take along to work. I had one lone can of root beer hiding in the back of the fridge that he hadn't drank, so I decided to put it to use making pulled pork. I had recently tried out a new barbeque sauce recipe (recipe at bottom of post) that I've fallen in love with. It is perfect for this recipe. You can simply use your favorite store-bought barbeque sauce (make sure it is a good-quality one), but I so, so encourage you to whip up the homemade version below. It's a dump-everything-into-one-pot kind of recipe and is super easy. Now, here's the fabulous thing about this recipe ... you don't even have to sear the pork on the stove top prior to getting it started in the slow cooker. Literally, just a few basic ingredients get tossed into the slow cooker insert to get this going. So, it's perfect for rushed, busy mornings. If you'd like your pulled pork a little crisp and caramelized, I've included the simple instructions for achieving that result at the end of the recipe. It's a totally optional step, but one that I find really takes these sammies over the top! Set the pork roast into the bottom of the slow cooker insert. Sprinkle with the salt. Sprinkle the chopped onions around the roast. Pour in the root beer and liquid smoke. Lid and cook on low for around 8 hours (or until meat is tender and easily shredded with a fork). Transfer pork to a large bowl and shred meat with two forks. Add in about 1 cup of barbeque sauce (reserve any remaining sauce if you've made the homemade version for time of serving) and toss to coat. Transfer shredded pork back into the slow cooker. Increase temperature to high and allow flavors to blend for about thirty additional minutes - with lid off - prior to serving on hamburger buns. Taste and adjust salt as needed. OPTIONAL STEP TO ACHIEVE CARAMELIZATION OF PULLED PORK: After completing the final step of the recipe above, heat up a large frying pan or skillet over medium-high heat. Spray lightly with non-stick spray. Place a good amount (about as much as you plan on eating/serving immediately) of the prepared, shredded pork into the hot pan. Allow pork to get a little caramelized and crisp around the edges while stirring occasionally. This should only take a few minutes. Serve immediately on hamburger buns. NOTE: The best way I've found to serve these sandwiches is to pile the seared pork onto my rolls (I prefer Kaiser rolls), top with the top bun, wrap the sandwiches individually in foil (not too tightly), place them onto the middle rack of a 350 degree oven for about 7 - 10 minutes, then serve. Combine all ingredients into a medium sauce pan set over medium-low heat. Bring to a simmer. Allow to cook while thickening for about 15 - 20 minutes. Stir occasionally. Use right away or allow to cool, then store in a sealed container in the fridge until needed. If making this sauce for the above pulled pork recipe, allow the sauce to come to room temperature prior to combining with the shredded pork if it's been stored in the fridge. What size slow cooker would you use? I was thinking of making this recipe for Christmas, I come from a family of 10 adults and 7 children. Do you think I should double it? And if so could I still make it all in one crock pot? I would double it if making it for that many people in my own family. And, I do think it can be done all in one slow cooker - as long as it's one of the larger oval/rectangle ones (like, at least, six quarts). I made this and my family LOVED it, thanks for sharing! 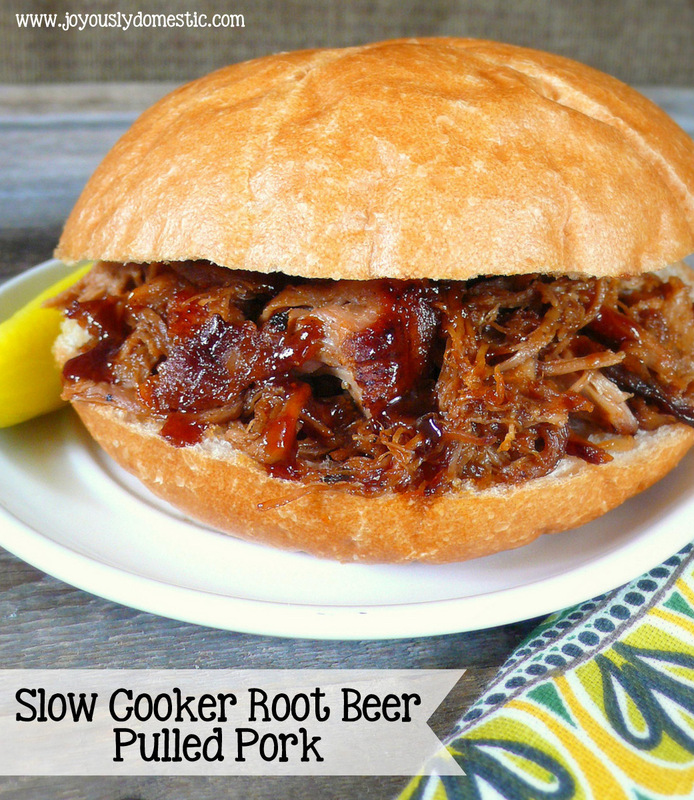 When I transfer the pork back to the slow cooker after shredding and coating with bbq sauce, do I leave the root beer in the slow cooker and mix it in with pork and bbq sauce? Mix it all right in. Is this something I could do the night before a party, for around 10 adults, and then reheat the morning of the party? If so, do you have any suggestions as to how to accomplish this? P.S. I love this blog. I'm so not domestic, but your recipes are easy to follow and everything always tastes great. You have a gift. Thanks for sharing it with the rest of us. Hi, Emily. I think you could prepare this the day before, then reheat. I would reheat in a lidded pan on the stovetop over low heat or by putting the cooked, shredded pork back in the slow cooker for a few hrs before your party. You might need to moisten things with a splash of water as you reheat.